The latest exploit in Zelda Breath of The Wild will make you filthy rich. It allows you to farm unlimited amounts of gems – rubies, sapphires and even diamonds. 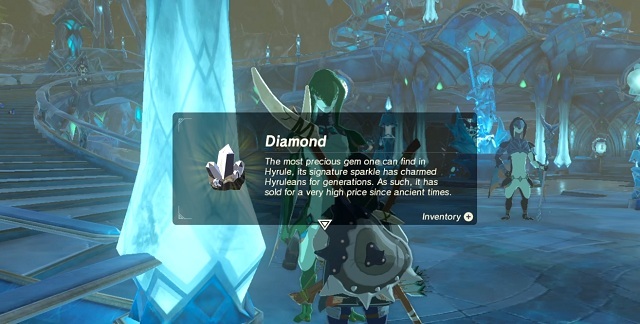 You can use this precious stones to upgrade some equipment, or simply to sell them and roll around in rupees. The Zelda BoTW unlimited gems glitch was only recently discovered by sneaky players, and it’s all thanks to the DLC pack. Diamond: There’s one in the chest near Digdogg Suspension Bridge, on the border between Gerudo and Central Hyrule. It’s in a chest on a floating platform, guarded by a bokoblin. If you put the medallion mark on the bridge above it, it will respawn after you teleport there. Use Majora’s Mask for best results. Amber, opal, sapphire, luminous stone: You can find this bunch scattered around Misko’s cave. It can be found during the Misko the Great Bandit quest. The entrance is at the base of Mount Floria, near Lake Hylia. Put the medallion mark there, and teleport once you’ve collected the stones – this will make them respawn. Ruby, topaz, amber, opal: You can find these in the Yiga Clan Hideout, southeast of the Gerudo Highlands, but only after you’ve beaten the Master Kohga boss. As with the others, teleporting will make the gems respawn, so put the medallion mark somewhere convenient. Once you’ve had enough, you’ll need to deactivate the glitch. To do so, go to the Deku Tree and sleep at the campfire. Enter the trial again, and teleport anywhere except the Divine Beast. This will allow you to use manual saves again.